Robert Michael Poole has written for a wide variety of magazines, newspaper and new media sources such as: AP, CNN, MTV, Interview, the Wall Street Journal, and global inflight travel magazines. 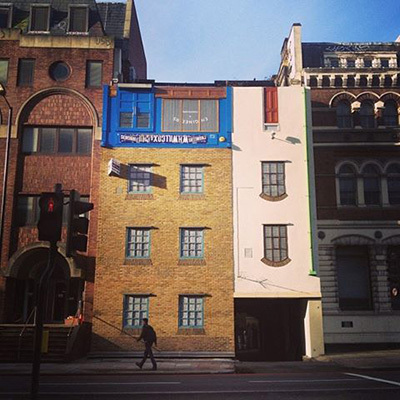 Discovered an upside down shop and building in Southwark, London. Impressive detail. Queen Elizabeth’s Jubilee celebrations are never complete without a rock star wielding an axe to inaugurate proceedings. For the Golden Jubilee in 2002 it was Queen’s Brian May atop Buckingham Palace. And for The British Embassy in Japan’s Diamond Jubilee party this month, the sword fell on the broad shoulders of Anglophile Tomoyasu Hotei. Not without good cause either. On his 50th birthday earlier this year, Hotei announced that he was about to embark on a challenge to start a new life in London. Liam Gallagher and Beady Eye were self-effacing when describing their efforts to raise funds for the victims of the March 11th earthquake and tsunami in Japan. The group were in Japan during the six month anniversary of the disaster after the band’s original tour was postponed due to safety fears. The band instigated a star studded benefit concert in London on April 3rd featuring Paul Weller, Primal Scream, Richard Ashcroft and Blur’s Graham Coxon to raise funds for the Japanese Red Cross. The earthquake and tsunami killed over 20,000 people after it struck at 2.46pm JST on March 11th, 2011. ‘Half of my quarter of a century belongs to music, so I never belonged to anything else,’’ says Welsh songstress Duffy. ‘‘I feel very able and ready!’’ The blonde bombshell was in Tokyo for her first full-length live show in Japan — at Shibuya AX on March 17 — and is still basking in the success of her debut album, ‘‘Rockferry,’’ released in March 2008. Three BRIT awards and one Grammy later, the old-school soul singer is the lady of the moment, with 5.5 million album sales to her name. Legendary English rock band Def Leppard brought the circus back to town last week. Paired up with fellow hair-metal survivors Whitesnake, the group began a four-date Japan tour with two nights at the prestigious Nippon Budokan in central Tokyo on Oct. 23 and 24. The two behemoths of 1980s pop metal have each weathered rather differently with age, and it showed on the opening night. While Whitesnake dragged themselves around the stage and lumbered through an uninspiring set, Def Leppard, buoyed by their latest album hitting the Top 10 on both sides of the Atlantic, captivated the audience as if time hadn’t passed at all.